Today I got another default LinkedIn connection message and I said “That’s it! I am writing a blog post about it“. So many articles have been written about LinkedIn (here’s the LI marketing section on Hubspot’s blog alone) and yet, many more people ignore all the valuable advice out there and choose to do the easy thing – hit the invite button without thinking it through. is very similar to the situation with writing a custom cover letter. You don’t expect to land a job if you send a standardized cover letter, do you?! Why then so many people expect to add a new LinkedIn connection to their network when they have not taken the time to research? LinkedIn is a professional social network. As such, I would love to connect with many people as long as we share a common interest or have a common goal. However, if my potential LinkedIn connections don’t take the time to research what my interests and goals are and instead, send me a default LinkedIn connection message, no way I am going to accept. The way you invite to connect on LinkedIn says a lot about you as a person and/or a LinkedIn user. Do you pay attention to details? Do you like doing stuff “in a hurry” or prefer doing your homework first? Are you just piling up connection numbers or are you after real life connections with whom you really want to network? Do you really use LinkedIn for business and like you are meant to use it? Having in mind these questions (and more), let’s compare a couple of connection invite messages. 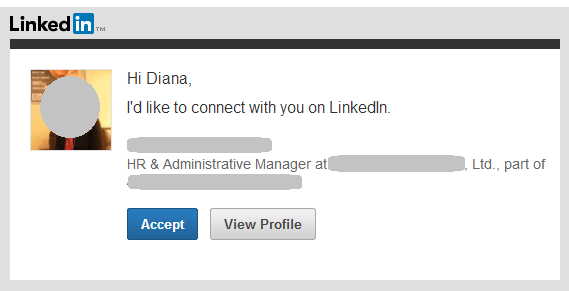 Hi Diana, I’d like to connect with you on LinkedIn. Hi, Diana. I came across a comment you left in the LI group Inbound Marketers and I particularly liked your insights on using LinkedIn for business. I’d like to add you to my network so we can stay in touch and exchange some insights on the topic. Let’s connect! Thanks, [your name]. In the first case, I most probably won’t even check the person’s profile but would dismiss him or her as a LI user who tries to increase the number of their connections, for whatever reason. In the second case, I would definitely check out the person’s profile and most probably, will accept the connection invite, will reply to their message and further network with them to see how we can help each other in the long run. 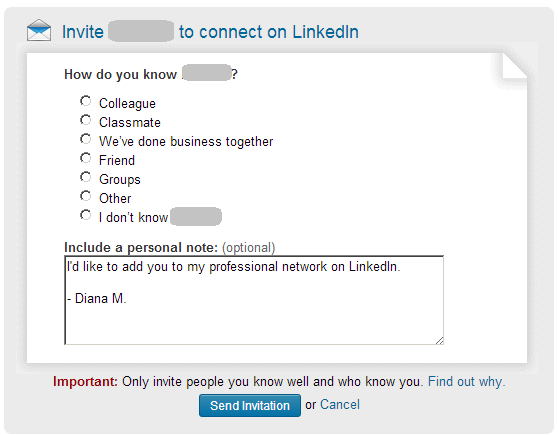 Now that we have cleared the why, let’s see where we usually send out default LinkedIn connection invite messages. When you are looking at someone’s profile on LinkedIn with whom you are not yet connected, you will see a Connect button right below the brief info about them. Clicking on that button will call another window for you to write your custom LinkedIn connection message. However, depending on the other person’s privacy settings, you may or may not be able to connect with them this way. The most common way for building our LinkedIn network of connections is through the groups we participate in. When I am long enough in a group, I see many repeat members who are more active than others. When I like most of the comments of a certain member, I learn more about them and send them a connection request. 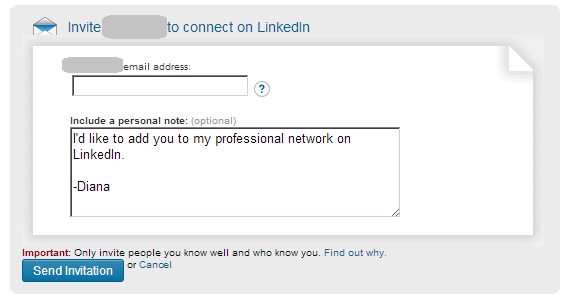 Then I am prompted to add a custom LinkedIn connection message (if I want to). I urge you to do so. So, let’s have a look at the Bloggers Helping Bloggers group on LI. If you like any particular member, before you send them a connect request, learn more about them and their interests, comments, etc. You can do that by looking at their profile and browsing the listed websites and social media profiles. You can also browse the member’s activity in the group you have in common. Here’s how. (I will use my own profile for illustration purposes). Once you know what type of comments the member leaves, what topics they get involved with, you should think about strategy – how to reach out to this specific person. If we continue the example with my LinkedIn profile, anyone who browses it will reach my blogs as well. One would be not easy to understand (non-English :D) but the other one is clearly about freelance and marketing. My recent posts are about freelance pricing where I give some hands-on practical tips on the topic. So this might be a nice “punch-line”. This could be a legit way how someone could invite me to connect. Hey, Diana! 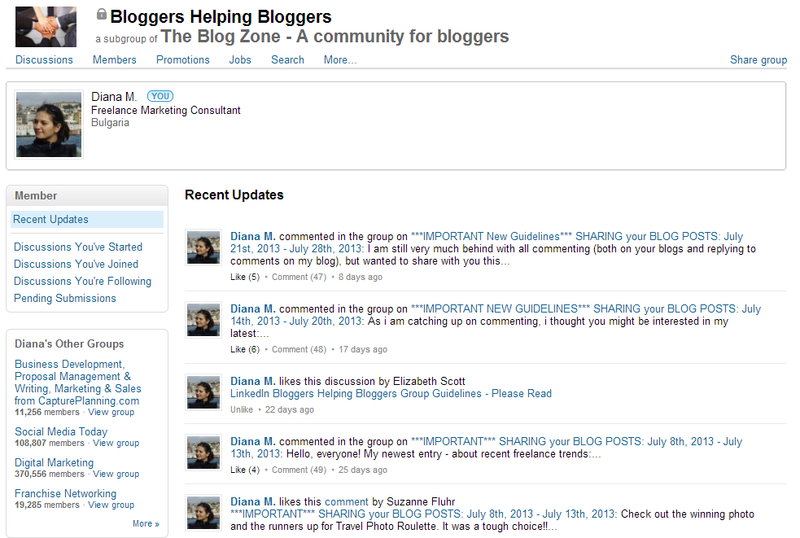 I am following your comments on the BHB LI group and I enjoy many of your posts on your freelance and marketing blog. I liked very much your recent posts about freelance pricing and how you give practical tips freelancers can use right away. Let’s connect so we can stay in touch and exchange tips and ideas! Remember, when you send an invite to connect with someone on LinkedIn, the ‘safest’ way to do so is by indicating you know them via a common group. Once the invite to connect is sent, be ware! LinkedIn entraps you into sending some default LinkdIn connection messages. If you click on any of the Connect buttons on this section, you will automatically invite that person to connect on LinkdIn with the default connection message. So, please don’t. If you see someone that you might really know, make the extra effort to click on their name, see their profile and then, click on he Connect button on their profile so that you can insert a custom LinkedIn connection message. Your turn: do you accept connection invites from people who don’t bother customize their message? This is an issue I have had, and am still having. For a while, I ignored those who didn’t take the time to personalize their connection request, and indicated that I did not know them. Then, I thought, from now on, I’m going to accept, and then ask people why they wanted to connect with me. That didn’t work too well, either. Then I just said, “F*** it, I’ll just accept” and see what happens. So far, I have not heard from anyone who asked to connect with me, so I’m thinking it may be a numbers game to them. Who knows? What I’d like to know is, “Is there a way we can ‘unconnect’ with someone?” On Facebook, you can “unfriend” someone; can we do this on LinkedIn? If so, please tell me, somebody, because I have a few people whom I’d like to disconnect! Thanks to anyone who knows the answers….please reply!!! thanks for your comment and insights, Lorraine! I’d suggest treat your LI account as a professional FB – don’t just connect with anyone who invites to to connect. Think “mutual beneficial” first! Thanks for the good ideas on what to put in the box when connecting. Sometimes people just need help getting a little more personal. I remember connecting with someone after hearing him speak in person – I complimented him on his talk. Great post Diana. My husband was just complaining because he gets random requests through LinkedIn on a regular basis, but lately when he tries to look at the person’s profile he gets taken to an advertisement! So he’s firmly moving to “delete automatically” if he doesn’t know the person or if the person doesn’t indicate clearly in the request why they should connect. I connect with folks on a regular basis who are in PR/Communications/social media/HR fields but I try to make some reference to why I want to connect. I will confess, the worst invites I send are to people I know well or that I have had several exchanges with. I have to admit I am guilty of that myself. I know that I need to create a personalized message and since reading your post I PROMISE to always send a personal message. Thank you for the wake up call. 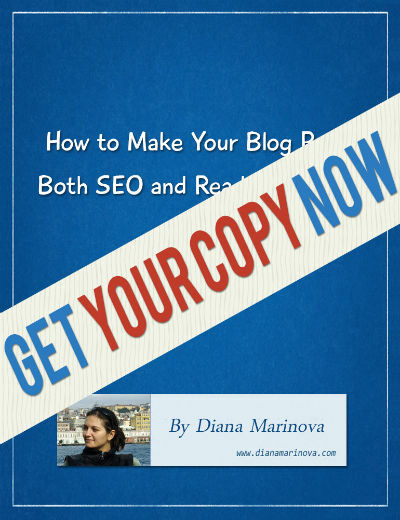 Diana-I am new to LI and really appreciate this article. I have just sent the default message and then do the automatic click to LinkedIn to connect with people you may know, I have been working on the social aspect since April so I am still finding my way around. I will not leave a generic default message again. Great post. I would definitely reconsider my expanding-linkedin-network strategy! Thanks for your comment, Peter! Always glad to help. I don’t think I’ve ever sent out a LinkedIn invite without customising my message first. Tell a lie – I once got caught out by that ‘People you may know’ screen. And I wasn’t best pleased about it. I also think it’s just plain common courtesy to properly check out the profile of the person you’re connecting with. Which reminds me – on your LI profile, Diana, you’ve actually put some thought into what you say about yourself. Most people don’t (to some extent, that also includes me). So this really makes you stand out. I particularly like the ‘I am not afraid to share my ideas’ bit. If I were looking for someone on LI to connect with or do some work for me then that’s the sort of thing I’d like to see. Unfortunately, LinkedIn has stopped allowing customized messages, at least for certain accounts. Now when we hit the “Connect” button, it just fires off the standard message with no opportunity to customize it. So don’t automatically assume someone is lazy anymore. Hey, Juli! Thanks for your comment. What do you mean LinkedIn has stopped allowing customized messages for certain accounts – what these “certain accounts” would be? There have always been cases in which you cannot customize the invite (one of them i have revealed in the post as well; i believe there are others) – but i will be very surprised if LI has altogether disabled some accounts from customizing invites. Can you elaborate? Thanks! I misspoke. It’s not for certain accounts. It’s for certain connection levels. Most of the time now when I try to connect to a 2nd connection, even from theit Profile screen, it just sends it. But not always. I can’t find a pattern. Also, it’s not just my account. I have access to a client’s LinkedIn, and it does it on hers as well. I’m not happy with LinkedIn and this change. Hm, strange. I see what you mean now, thanks for clarifying, Juli! You’re welcome. I think it’s important to let people know that the change is out there. I used to think an invitation without personalization was just laziness. Until the first time I sent one and never got the option to personalize it. Now I’m more forgiving when they show up. Sure it is, but i was never “judging” those people who didn’t customize – some maybe were lazy indeed, others didn’t know better, third were tricked by LI, whatever the reason. Hah, i didn’t think of the mobile app, thanks for this addition, Cecile! I’d like to clarify that when you connect with people through “people you may know”, there’s no way to customize that even on desktop. However, you may be on to something as the LI mobile app really has a life of its own… I must test further. This is such a great post, Diana! I have linked out to it and expanded in a post about writing personalized requests to customers. Hope you find this as useful as I found yours! Hi, Jen – i have no idea how your comment skipped my radar – how rude of me to not even acknowledge how much i appreciate you linking to my post! Very instructive and good exchange. You are doing a favor for many of us who receive or send default connection message (including myself). I closed my Facebook account a few years back because of the number of request I received, mostly from people I did not know. I love connecting with people from different countries, races, educational background and religion. Hwoever, I was not sure, most of the time, why they wanted to connect with. That’s why, as you mentioned, a customized message is important. This bothers me so much but you know theres no way to insert a custom message into linkedin anymore unless youre a premium user. Oh great please let me know how- Ive been using Linkedin in for over 7 years and Ive done it before but recently I have been unable to. Im currently looking at a profile. I can “Connect” which automatically sends the default request, or, I can send inmail which a premium membership is needed. I can also ask for an introduction etc etc. But can no longer connect with my own introduction. Would love to figure this out so your response is appreciated. Hi,Ian – in the post on which you are commenting, i have explained how i do it. See the heading in the post “We are prompted to customize the LinkedIn invite when networking with a particular person” – that is where the how-to starts… This is how i do it. I just sent you a customized invite to connect on LI – and i did the way i have explained in this post. Is it really not working for you? Maybe you are on mobile? Recently LI changed the way their mobile app works – maybe you can;t customize on mobile? Ah- it was on mobile. I just tried again on my desktop and it worked properly. Thanks for your detective work and quick responses! Thank you for the interesting post, you would think a site that is aimed at connecting folks would not send a “a person of trust” as a default connection message. One thing I don’t believe that was touched on (or I missed), if you look at a suggested contact on the “people you may know page”, to the right of the “connect” button is a “pen and pad” button that will allow you to customize a message. One question I have, do you know why you can send a default message to a 3rd degree connection (or anyone) from the search page, but if you go to their profile page, you have no option to connect. Always made me wonder. Yes, i have noticed as well that you may send an invite to connect with someone at some place but you cannot send an invite to the same person from another place (the example you give for 3rd degree connections is such instance) – i have no idea why it is that way; have not really noticed a pattern. Something else in your comment made me wonder though – what do you mean ” you look at a suggested contact on the “people you may know page”, to the right of the “connect” button is a “pen and pad” button that will allow you to customize a message.” – i do NOT have such option… I see a “Connect” text link and to its left – a plus sign (or something) which does the same thing like the Connect text link (which is sending the default invite). Maybe this is another difference between desktop vs mobile platform; or free vs premium profile… can you please elaborate? thanks! This would be on a desktop free LinkedIn account. I tested it Friday, and found that one click opens up the dilogue box, and you enter your text. it is very easy to click through and send the default message.If there would be away to post/ send images I would be happy to. Thanks for the update, Thom – i guess LI started paying attention to what members send them as feedback. I wish they remove the “friend” feature now – or at least ask for an email… Since the last change, i get 20 default invites every week from people who i don’t know and who indicate i am their friend – simply because then (as a friend) they don’t need to share a group with me, nor to add an email in order to invite me to connect. Sigh. Thanks again for the addition! Some days ago, I got the opportunity to see you in LI and visited the link (blog) and sent out a LI without customizing my message first. Sorry for applying ‘People you may know’ screen. And found your amazing style of communication. 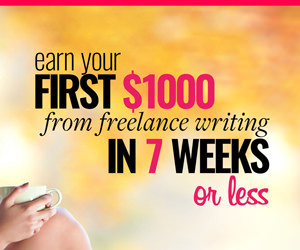 You also have been blogging about an extra ordinary niche. Thanks for your comment and connection invite, Rafiqul! I am glad you liked this communication approach of mine. No problem sending me a default invite – as long as you don’t get angry with me for not accepting it instantly but asking for more info 😉 I am glad we connected. Stay in touch! This is a great idea; unfortunately, in some cases, it’s not implementable. LinkedIn is creating some accounts that do not allow access the the personalized message screen. Clicking on “Connect” on any screen (profile, you may know, search results, shared connections) results only in a default message being sent with no options to do otherwise. Tech support at LinkedIn has replied that they are A-B testing standard account invitation settings and this more limited version of invitation. From what I’ve been able to find, this has been going on for at least a year (since summer 2013). After much research on behalf of a less technically savvy person who had this problem for some time (inability to send invitations through any method), it appears that some people are just out of luck. In fact, that’s how I ended up here. Perhaps in the past, default messages were viewed as rude; in the near future, it may be the standard if LinkedIn goes ahead with the rollout of the new functionality (or non-functionality). Interesting, first time i hear of this testing LI is doing… Still going on? I sure hope LI will NOT remove the customized invite as that is the only legit way we can quickly connect. This article was really helpful. There is an issue that I face though. Somehow, I am unable to write a good personalized message to connect with an existing client whom I have done a fair bit of deals with (in real estate consultancy). Any sort of help on that would be really appreciated. I have a good relationship with these clients and would like to maintain them professionally over Linkedin as well. Hi, Karan – thanks for your positive feedback about the post. I would love to help you out bu I am not sure I understand correctly what you are asking for. Do you mean you don’t know what to say in your connection invite? Karan here – we’ve done a fair bit of deals in real estate consultancy so I thought it’s a good idea to connect on LinkedIn, too and stay int touch! Shall we? Of course it can be something fancier or more personal, depending on your relationship with the specific client. But as long as it comes from the heart and represents the truth, you’re good. It’s easier with people you know personally (like in this case – you’ve obviously done business together) because you can just say who are you, that based on your doing business together, you want to add them to your LI network. hat’s it. Hi, the functionality of personalizing your invitation message is not working (at last for me), even with a Sales Navigator account. The function appears to be there in various places where invitations are possible but, after testing it, I realized that it is not working. I’ve wasted many hours writing direct, compelling personalized messages but now realize that LinkedIn has wasted my and many other people’s time. I started to wonder about it after realizing that NO ONE was replying to these messages. After testing using a fictitious account, I realized that the messages do no go through at all. This is infuriating as I’ve been personalizing these for the past several years. The LinkedIn UI designers/coders are amateurs. Hi, Steve – thanks for your feedback. May I ask how did you test and reach the conclusion your messages don’t go through? I know how bad I am at this as you would have noticed but thanks to your this great content for LinkedIn which exactly is the key to know if the person wanting to connect is interested to actually make a connection. I now understand fully how useful it can be and how powerful this little thing is to increase the chances of acceptance. Will fully take note of it from now. Thanks for this great piece of content, Diana. I am so happy to share it! Good morning Diana, my name is Isabella. I don’t have a LinkedIn account nor any other social network. I DO know the person, I know the profile is real, (opened about 3 years ago) with more than +500 connections. This is the first time I received an invitation from this person, and I only received it in one of my email accounts, although we’ve shared email contact many times. it takes me to the LinkedIn page. I don’t want to accept an invitation and connect, if it was not send to me by a real person.. Thank you so much for taking the time to read my question and for your reply. Hi, Isabella. You pose an interesting question – I am not sure how to answer it. The majority of default connection invites are send out manually – meaning that the person saw your photo, invited you to connect, but he or she was too ‘lazy’ to personalize the message. So although not personal, it is not automatically sent, it’s still the person who hit the invite button. If you are not on LinkedIn and you got an invite via email, my educated guess would be that your friend imported her email contacts to her LinkedIn account. This would trigger a mass inviting, for the lack of a better word. All her email contacts would get the same message, inviting them to connect. This is a valuable article that have changed my way of engaging people through social media especially on LinkedIn.I have come to realize that a connection should add value to my thinking in every field of my life.Diana, you have opened a new world of thinking to me from now. Once again, thanks so much for this great article. Great tips here! Never knew there was another way to do it from the “people you may know” mass connection screen. I have a question though – I’ve had LinkedIn since 2012 and have been sending personalized messages on connecting since probably 2013 when I had a career class on it in college. But…. I have NEVER seen a message attached to a new request I get from someone, default or otherwise. Am I missing something?? I’ve even searched for it before and was never able to find anything. I’m happy to know I’m personalizing the messages I send out but have never been able to see if anyone has personalized anything to me. I’ve also gotten random requests lately from people on the other side of the country and not in my industry – and again never saw a message of any type along with the request, so I’ve been declining. Hopefully I didn’t miss some opportunity in a message they might have sent…! I’m very tech savvy too so I’m quite confused and embarrassed as to how I have never found this! Where do I look? Please help!! Thank you!